Having spent four days in Casablanca—three days too long, according to legit traveler standards—we thought of skipping Rabat, Morocco’s capital city, and instead, head straight to Chefchaouen, the country’s famous Blue City. 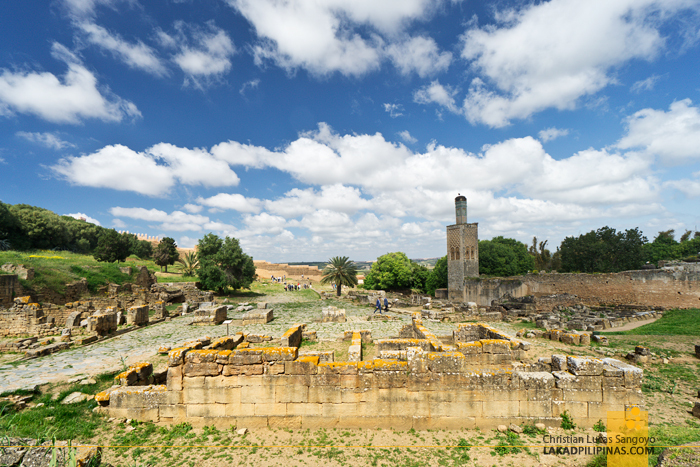 We’ve been reading a bit before going, and Rabat, being one of the four Imperial Cities of Morocco (the other three being Marrakech, Meknes, and Fes) and the UNESCO World Heritage Site inscription attributed to its medina and surrounding sites decided it for us. We’re going. 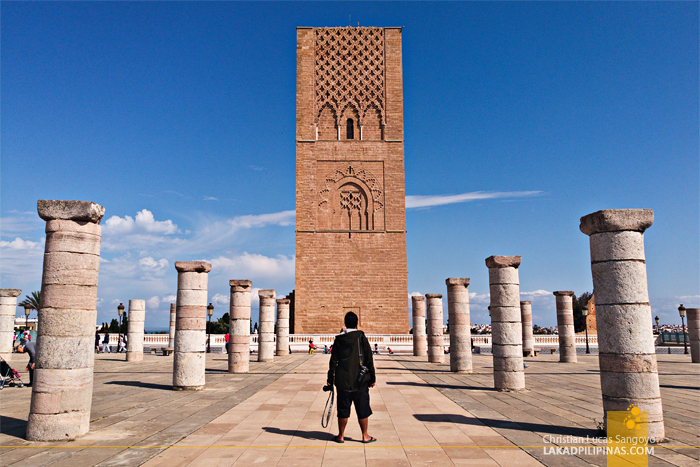 Our Rabat three-day itinerary basically went like this. 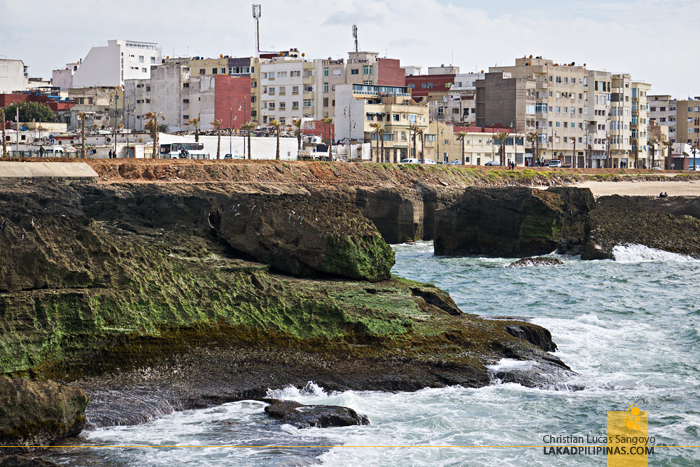 The first day, half of which was spent transferring from Casablanca to Rabat, was spent roaming the northern side of the Old Medina—the cliffside area, lighthouse, beach, the kasbah, and parts of the medina. The second day, we went to the farther places in Rabat, visiting the Hassan Tower, the neighboring town of Sale, and the Chellah. 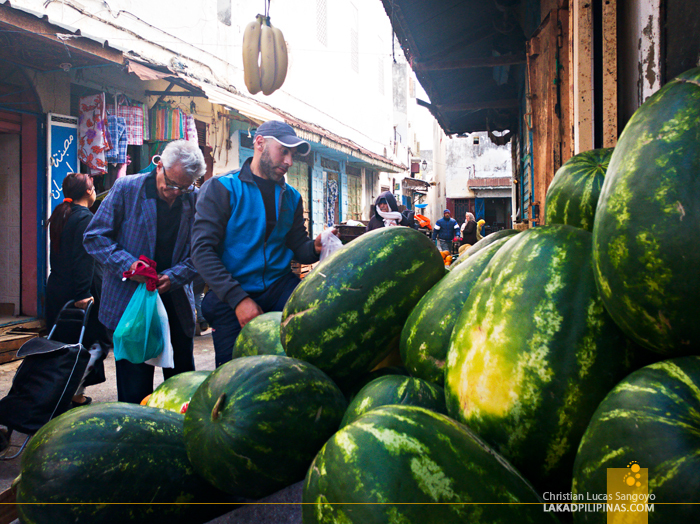 On the third day, we roamed the Old Medina again right after breakfast, then prepared for our next destination, Asilah. 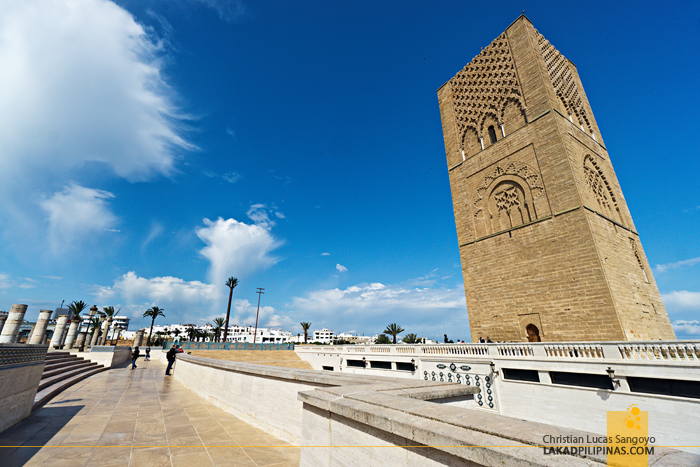 From Casablanca, Rabat was just an hour’s ride away by train (MAD 37.00 | USD 3.80) via Morocco’s official train network, the ONCF. 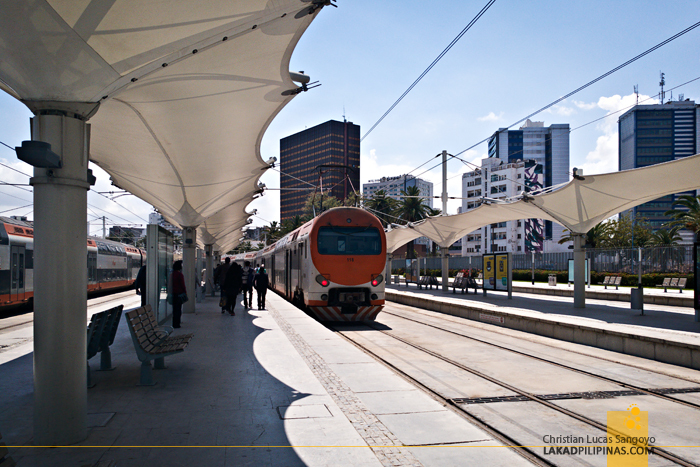 We departed from Casa Port Station and alighted at Rabat Ville Station at the center of the city. The handsome neo-classical train station was bustling with activity as we wended our way to… the toilet, which was quite hard to find. Then it was time to walk. 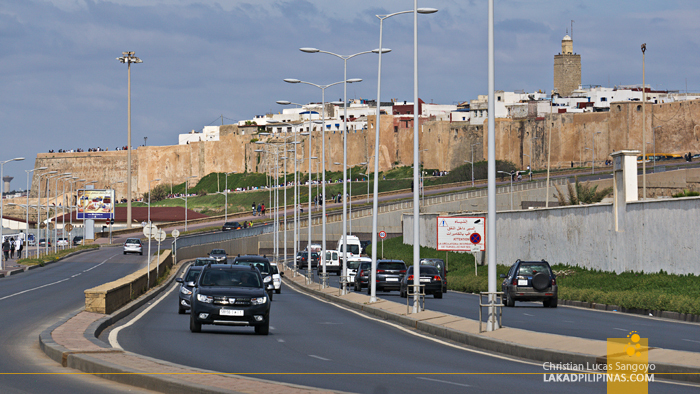 While we were still a bit guarded after Casablanca, Rabat seems to have a safer feel. Its wide avenues lined with white colonial buildings are busy with people walking and doing their thing, plus there are lots of policemen around making us feel more free to snap photos using our actual cameras rather than our phone. 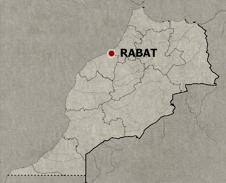 The station was a mere ten minutes away to Rabat’s medina, but we weren’t staying inside its walls this time. 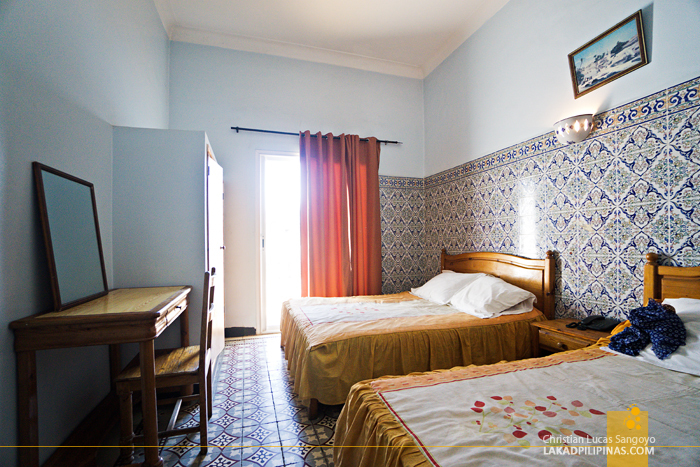 We found a relatively cheap accommodation literally just two minutes away from the medina’s main gate. 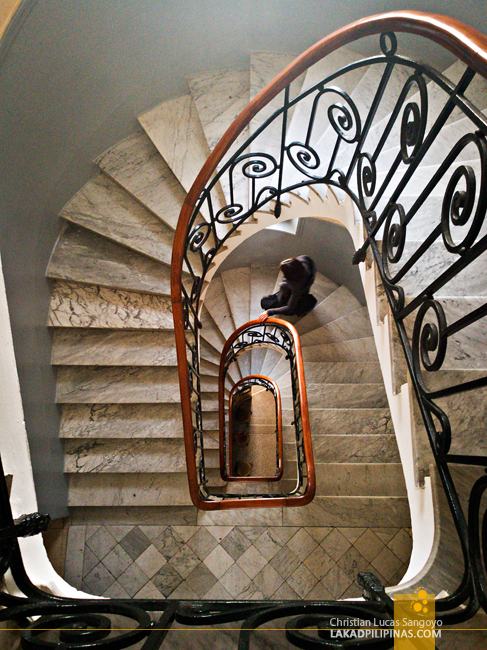 Hotel Splendide was our lodging of choice in Rabat. While it’s not as splendid as its name suggests, it offers a good location for a fair price. 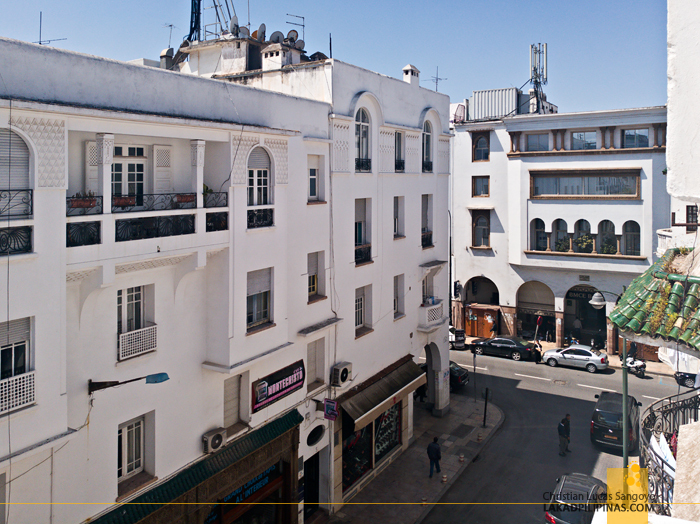 The room we got has an en suite toilet and bath, however basic, and a spacious veranda overlooking the streets of Rabat. Again, we were billeted at the top floor, which on any other country would be more than fine, but as with most lodgings in Morocco, there are no elevators to help you go up. We hauled our backpacks five floors up. Hernia alert for those with huge luggage. And again, no free breakfast. A quick wash and unpacking and we’re soon onto the main artery of Rabat’s medina. 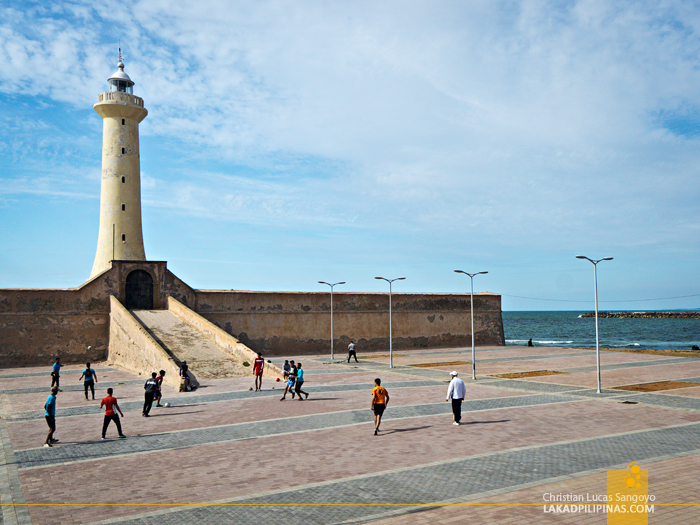 Our goal was to reach the Rabat Lighthouse before the sun sets. We walked on an easy pace, confident of reaching our target with much time to spare. Exiting the massive bab (gate) of the medina, we came upon a ragged seaside cliff we didn’t see listed anywhere online, even on Google Maps. The rock formation is on level with the road, then drops to about six to ten meters to the crashing waves of the Atlantic below. It wasn’t easy navigating the formation, with sharp rocks protruding from its surface—I’m guessing coral stone. 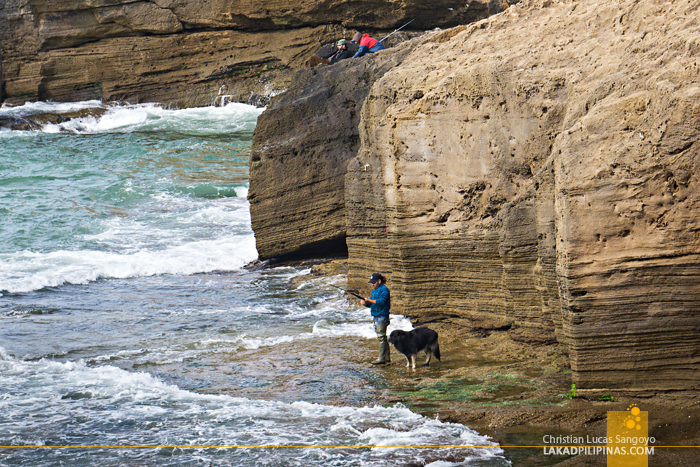 The area seems a popular place for lovers waiting for the sun to set, friends shooting the breeze, and fisherfolks and enthusiasts looking for a catch. It kinda reminds me of the Bolinao rock formation in the Philippines, only on an urban setting. 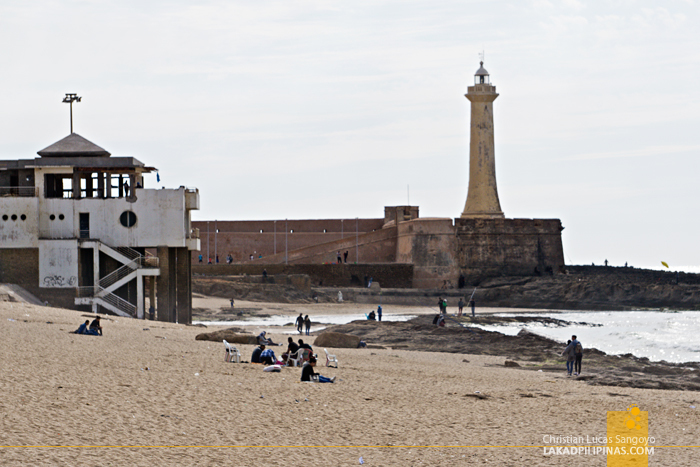 The Phare de Rabat as the French call it, can be seen from the rock formations. And after having our fill of sharp rocks uncomfortably poking our soles, we turned to the lighthouse. Also called Fort de la Calette Lighthouse, the graceful cylindrical structure, tapering as it ascends, was built in 1919 and still functions as a guide to boats and ships up to this very day. It rises to a height of thirty one meters (or twenty four, depending on where you read) and is protected by a wall against the Atlantic. And as is the case in any Moroccan city, the protected court transforms into an impromptu football field in the afternoons. 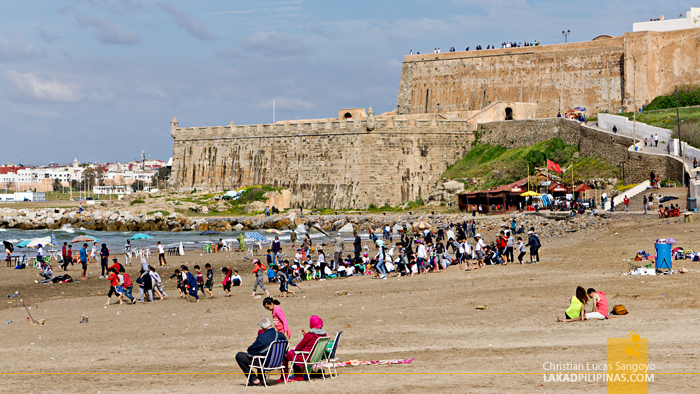 And just right on its east side is the Rabat Beach. It was filled with locals that afternoon—kids playing along the brown sand, the elderlies on rickety plastic chairs enjoying the waning sun. There were hardly anyone on the water, the waves were quite strong. 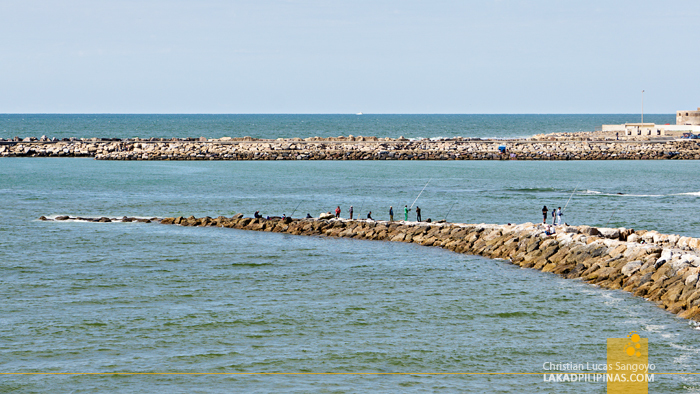 A massive groyne made out of massive stones extends for almost half a kilometer from the shore to the waters. 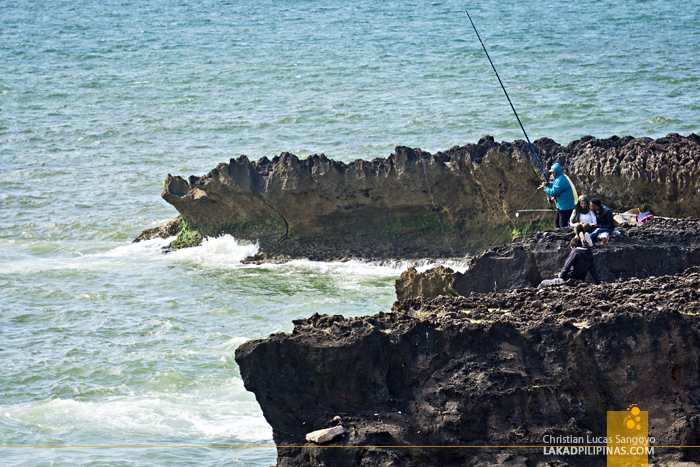 Its end point, labeled as the Ocean View on the map, is another popular spot for lovers and fishermen. It’s actually not made for tourism but to protect the beach from sand erosion. 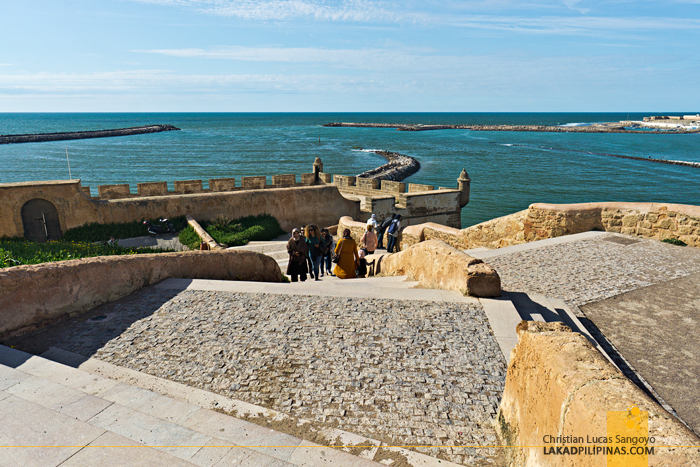 Overlooking the beach, the lighthouse, and the rock formations is the Kasbah of the Oudayas, a medievalish walled city from the 10th century used by the Almohad Caliphate—a Moroccan Berber Muslim empire—and is part of the UNESCO World Heritage sites in Rabat. 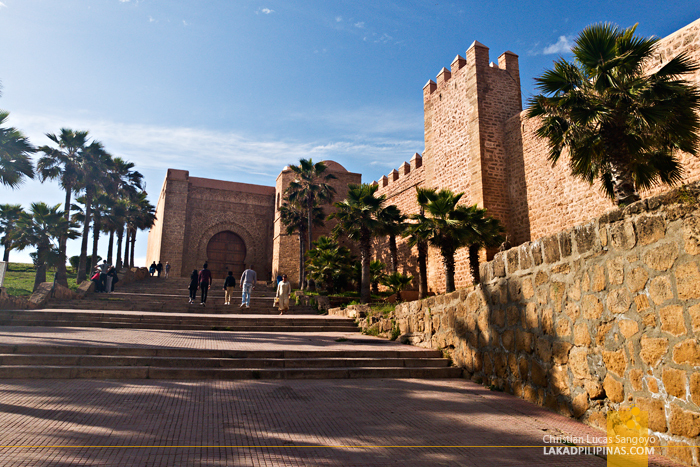 A kasbah is an older form of a medina, usually smaller in size and built mostly for protection against attacks. 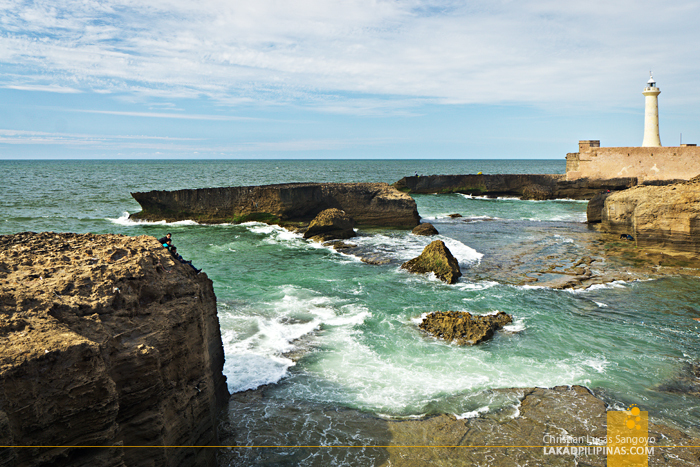 Although this isn’t one of the filming locations of Game of Thrones in Morocco, going up its massive steps from the beach, we can’t help but hum the intro for the show. 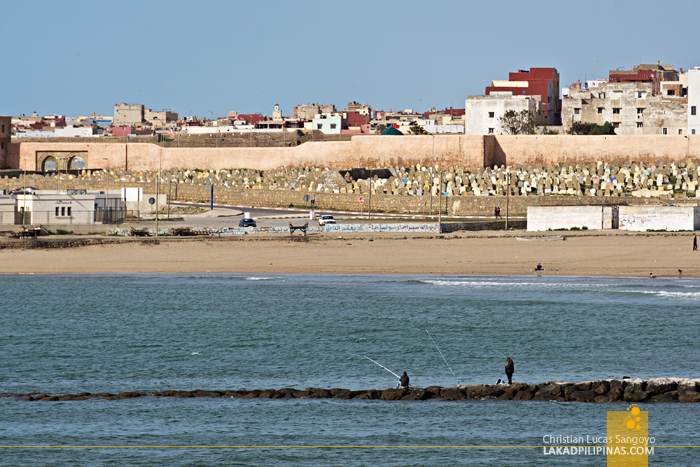 This kasbah stands outside the walls of Rabat’s medina and looks over the Atlantic and the mouth of Bou Regreg River—a water way that separates Rabat from the older neighboring town of Salé. 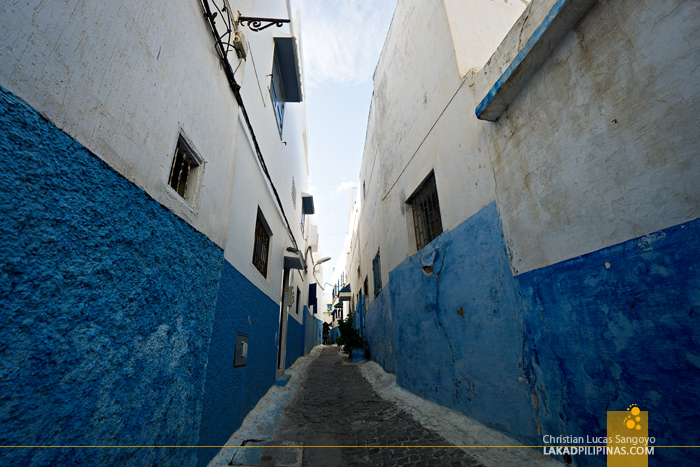 Unlike most kasbahs we’ve seen around Morocco, this one is uncharacteristically huge, with narrow alleys painted in whites and blues similar to those in Chefchaouen. Some parts have restaurants, actual homes, a mosque—the oldest mosque in Rabat, and a sprawling garden which we explored next. 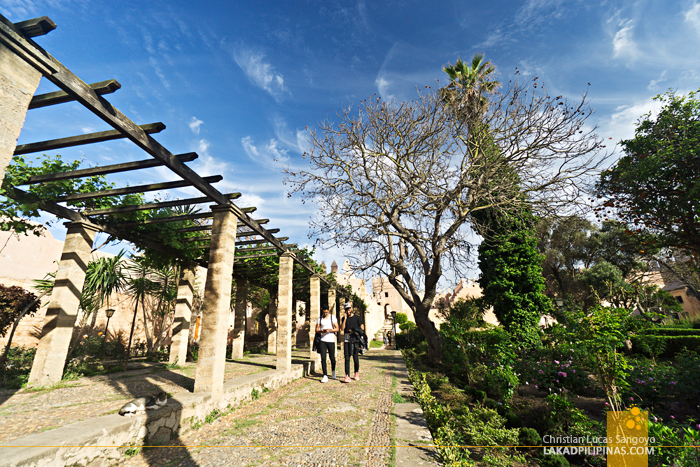 Constructed by the French during the 1800s the Andalusian Gardens is a somewhat formal garden laid out on the southern part of the kasbah near the massive and ornate Bab Oudaia gate. The garden, which seemed to be haphazardly planted with orange trees, hibiscus, bougainvillea, agapanthus, daisies, hydrangeas, and marigolds may have been glorious during its heyday as the entrance to the Andalusian Palace (now a museum), but now looks forlorn and forgotten. 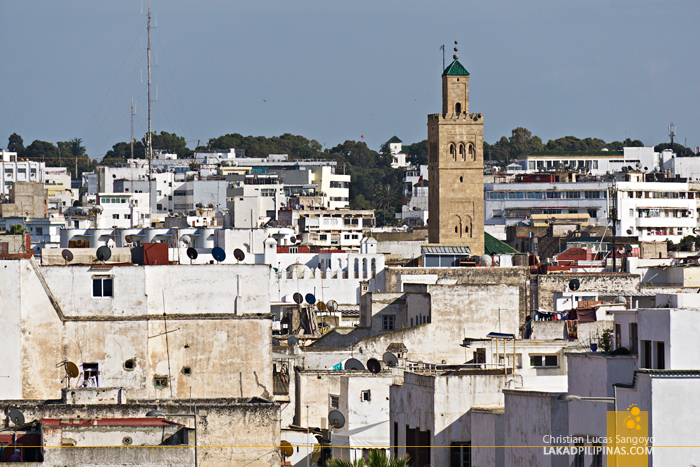 Made by the Andalusian Muslims who fled from Spain when they outlawed Islam, the old medina of Rabat is what the city once was before the arrival of the French in 1912. 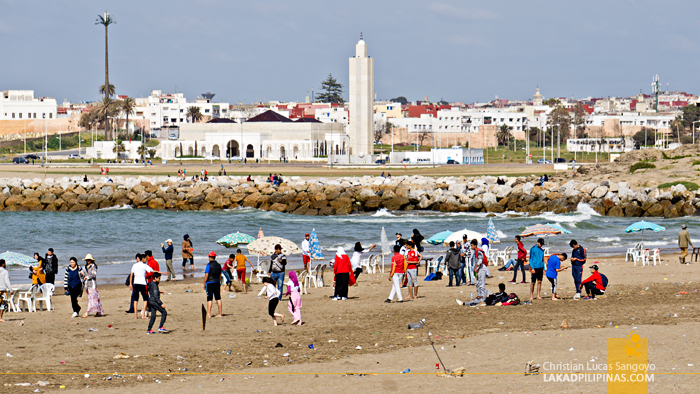 Rabat, once called New Salé—after the neighboring older town of Salé—only became the capital of Morocco after the center of government was relocated by the French from Fes. This led to the expansion of the city outside the wall. Rabat’s medina seemed livelier than those we found at Casablanca. 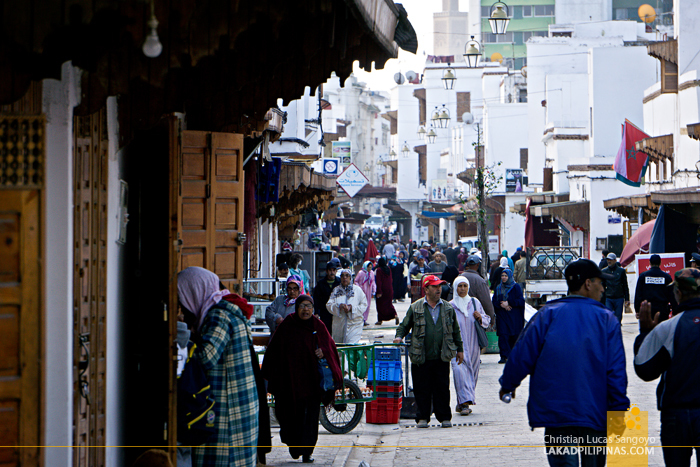 It isn’t a large medina and can be explored within half a day. 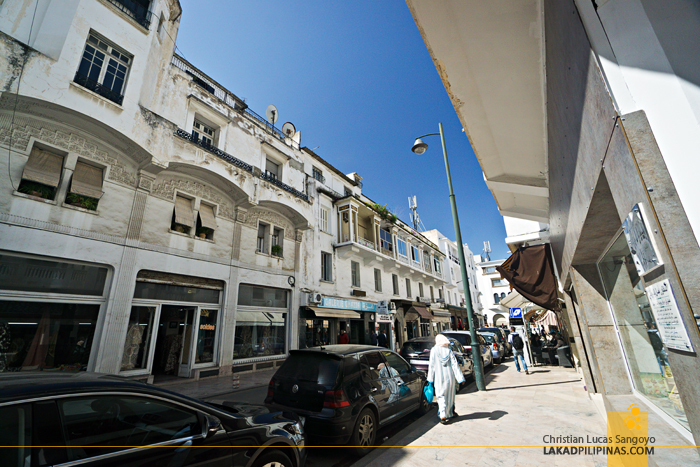 One its main avenues is the Avenue Mohammed V, filled by restaurants, small eateries, and shops. It runs straight off-center of the medina. Venture on the side streets and you’ll easily get lost through a never-ending maze of rues. 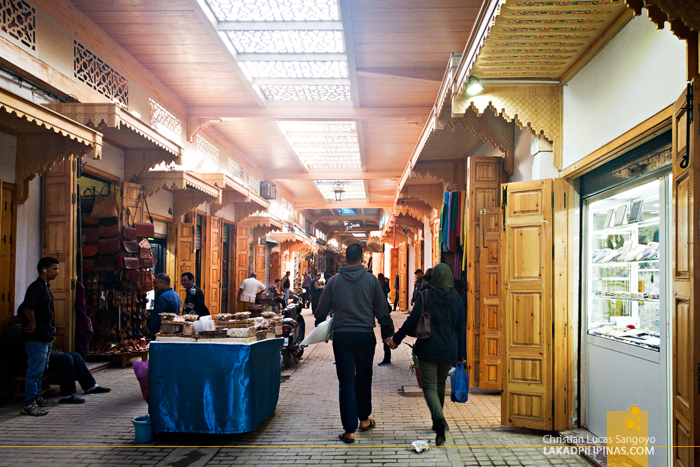 Most of the souks or marketplace selling similar items in the medina are covered by a translucent roof, making it a pleasant place to shop during any kind of weather. 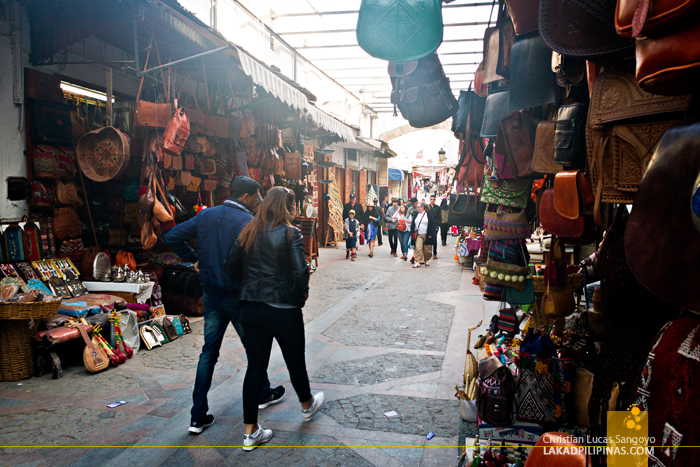 And like most medinas in Morocco, you can buy all kinds of leather goods—bags, shoes, jackets, wallets—metal crafts, jewelries, antiques, woven textiles, and any other wares you can find on a legit marketplace. One particular rue, the Green Street, sells meantha tea leaves which is considered as the Moroccan equivalent of a vodka. In all fairness, we didn’t feel threatened during the whole time we were inside the old medina—even during the time we decided to comb the inner and narrower parts of the city. The people we talked to are quite friendly, and those we didn’t talk to didn’t bother us at all. Well, except one particular lady who accosted me for taking her photograph—Moroccans generally don’t like to have their pictures taken. 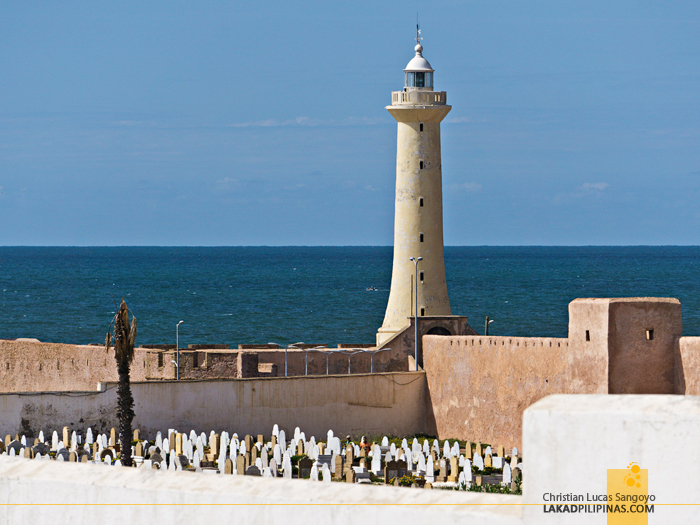 The whole old medina of Rabat is considered as part of the UNESCO World Heritage Site in the city. 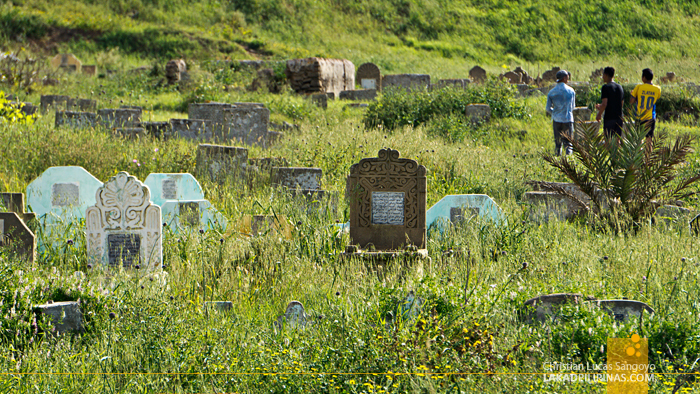 Not really found on guidebooks, one of the places I noticed around Rabat’s old medina are the massive graveyards. 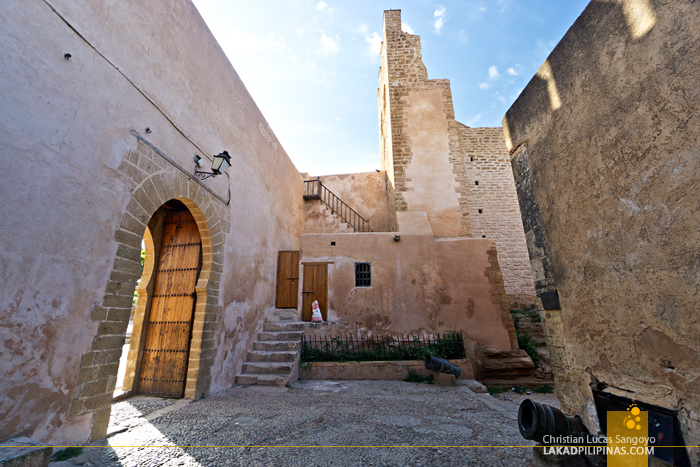 The largest one we’ve seen is the Cimeterie Chouhada which is about a fourth in size compared to the walled city. 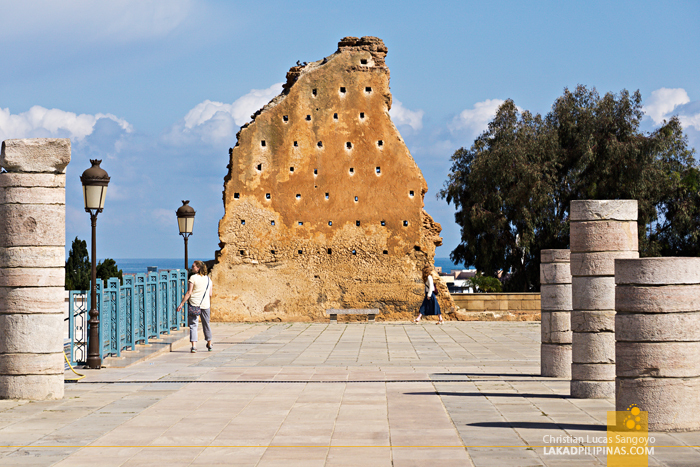 Like the medina, it is surrounded by a gargantuan wall. It can be accessed, even by tourists, but we didn’t get to enter it. You won’t find any crosses here since it is a Muslim cemetery, but it’s as solemn as any graveyards can be. 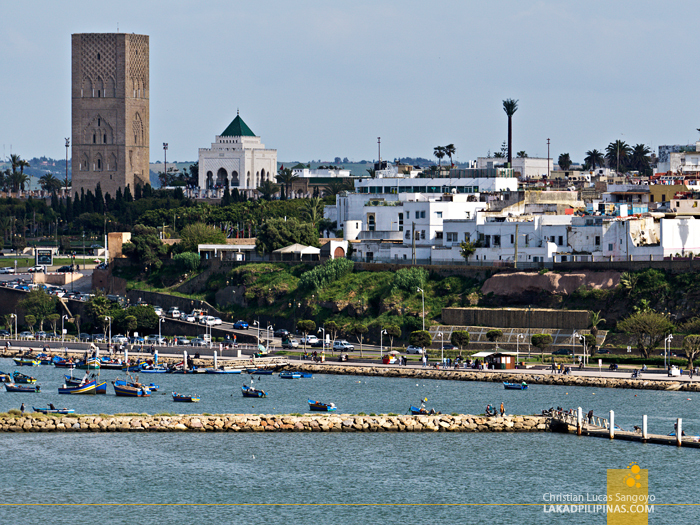 On our second day in Rabat, we chose to explore areas outside the medina. 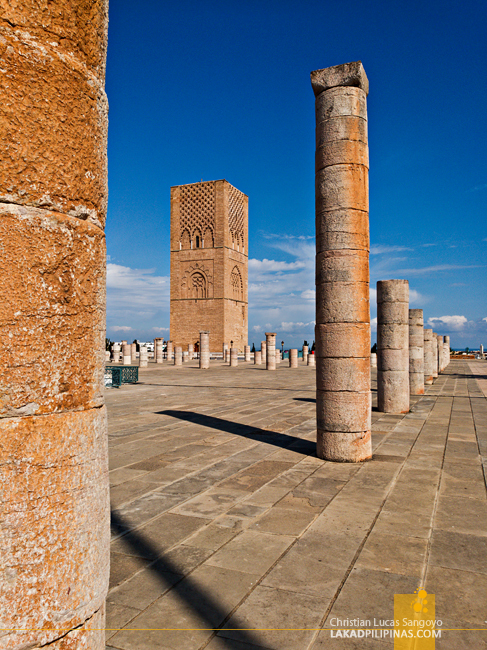 One of these is the Hassan Tower, part of the UNESCO World Heritage Sites in Rabat. Located near the eastern corner of the medina on an elevated embankment overlooking the Bu Regreg River, the Hassan Tower was meant to be the tallest minaret in the world at the time of its construction. Only thing was, the caliph or leader that commissioned its building died in 1199 before its completion. 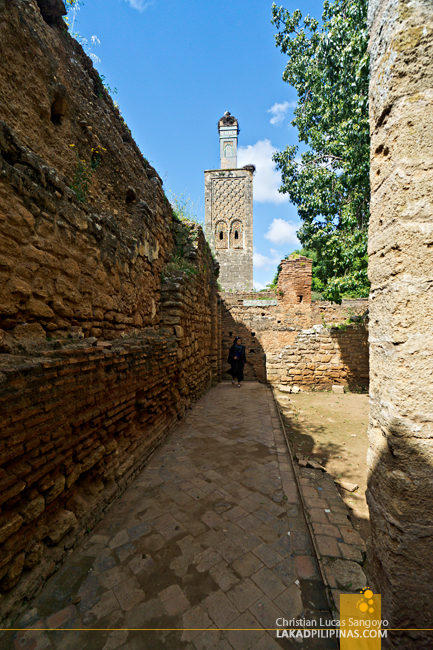 What’s left of the complex are less than partially completed walls, circular columns that should’ve supported the hall of the mosque, and an intricately decorated tower—which I assume to be the minaret—made from red sandstone. At the other side of the square an elevated mausoleum. 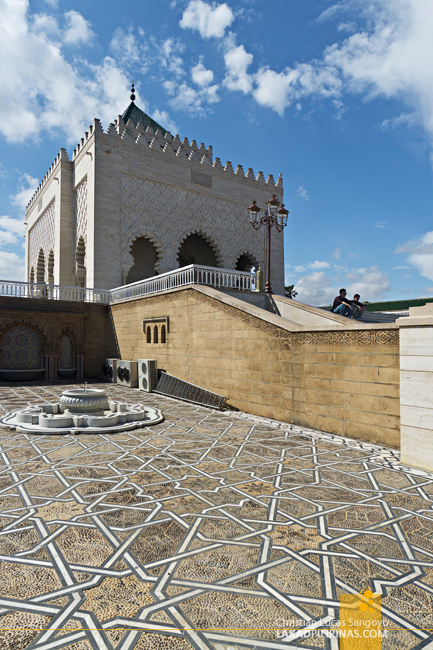 Enshrined inside is the tomb of the Moroccan King Mohammed V and his two sons, King Hassan II and Prince Abdallah. This is one of the rare holy places in Morocco where non-Muslims are allowed to enter and even photograph its beautifully gilded interiors. And guess what, we didn’t enter it thinking it’s again off limits to us! Darn. 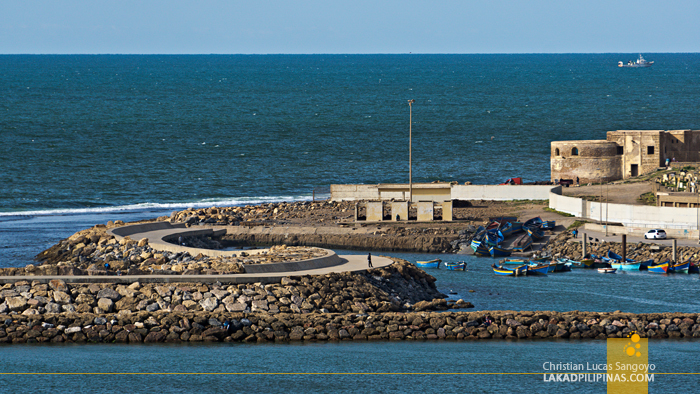 Since we can see the town of Salé from the Hassan Tower, we decided to give it a visit. 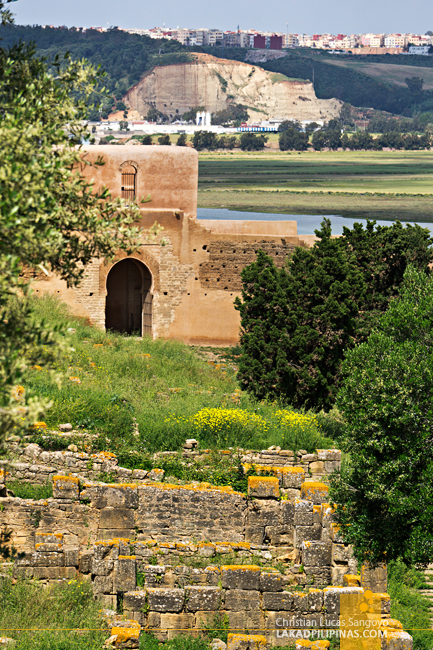 Salé is actually the original settlement in this part of Morocco. 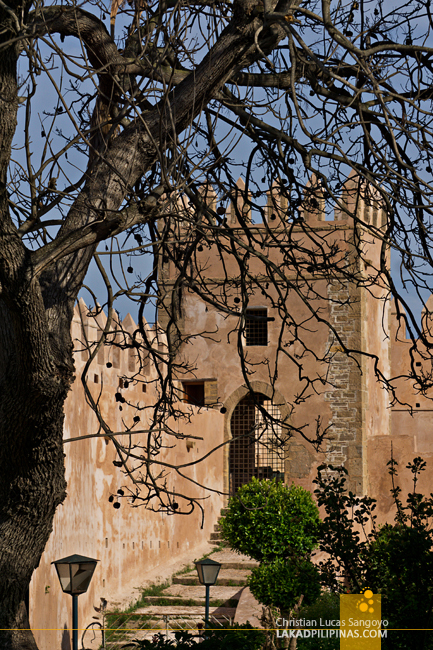 In fact, when Rabat was founded by the Andalusians, the original name given to it was Salé la Neuve or New Sale. 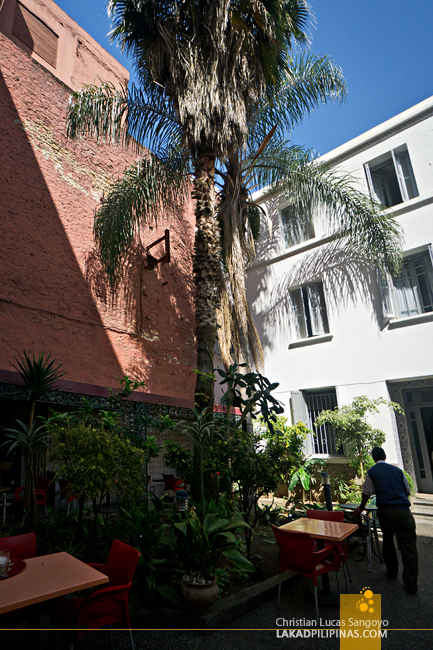 Plus, this is where we’ve had our first rice meal in Morocco, see our Rabat-Sale Food Trip post. Interesting, yeah? 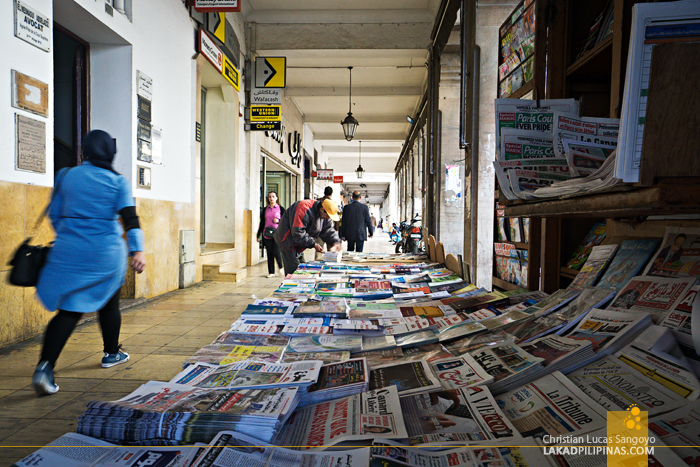 So interesting, that I’m dedicating a whole article about Sale Old Medina. The latter half of our day was spent walking from one of the outer gates of Rabat Medina to the outer outer gate of the new medina. 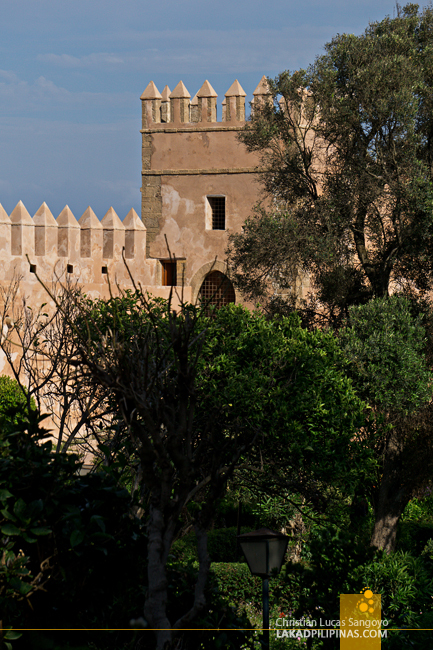 I’m really not sure if there’s a bigger medina covering the original Rabat Medina, but as we walked out into the highway to see the Chellah, we saw one huge wall over the city. Anyways, what we really went here for was the Chellah, another walled city, not for the living, but for the dead. The Chellah was used by Berbers during the Almohad Empire as a burial ground for their royalties. 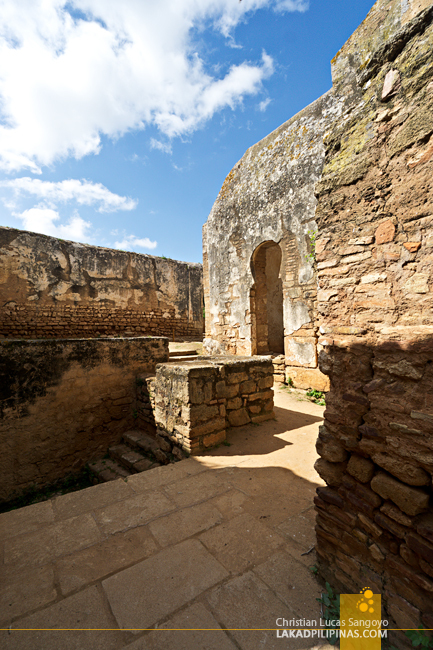 It was then utilized by the Marinids which ruled Morocco during the 13th to 15th century, as what it is now, a holy necropolis or chellah complete with a mosque, minaret, and royal tombs. But before all that, it was the Phoenicians and later, the Romans who occupied the area. It was really interesting how the Roman Empire’s grip reached all the way to Morocco! 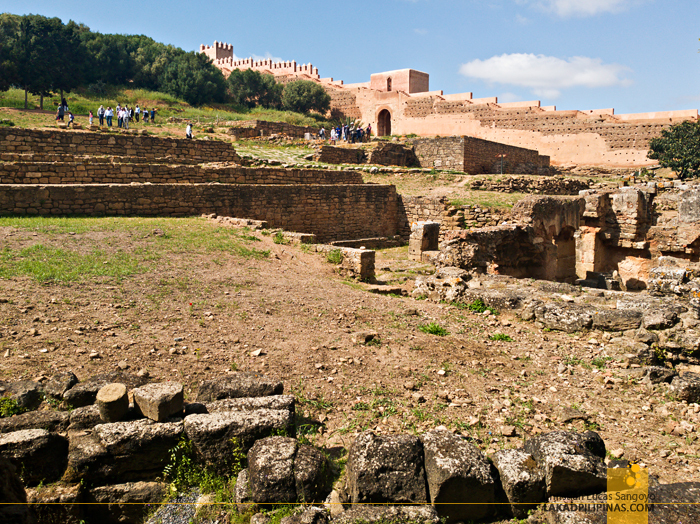 In fact, Sala—its former name—was a center of Christianity during the 2nd century. 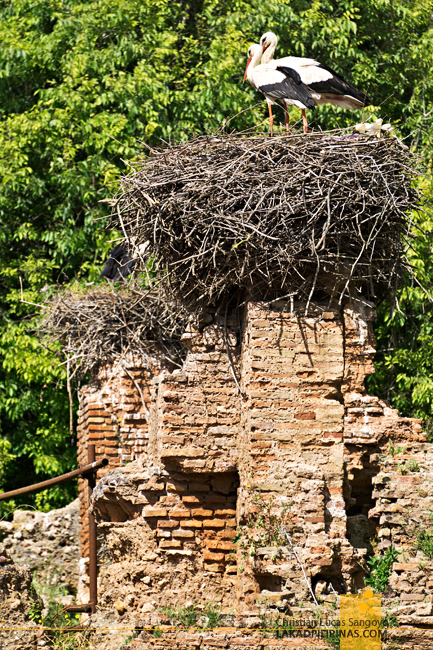 The area now looks like a rubble of ruins towered over by the original minaret, its top made home by a couple of giant storks who has a massive nest right on the apex. The birds also coveted more of the premium spots along the necropolis, their calls echoing through the empty halls of the dead. Quite a somber way to end our tour of Rabat. I feel nostalgic. Your post reminded me of a fabulous Morocco trip I had last year. Thanks, awesome pics.